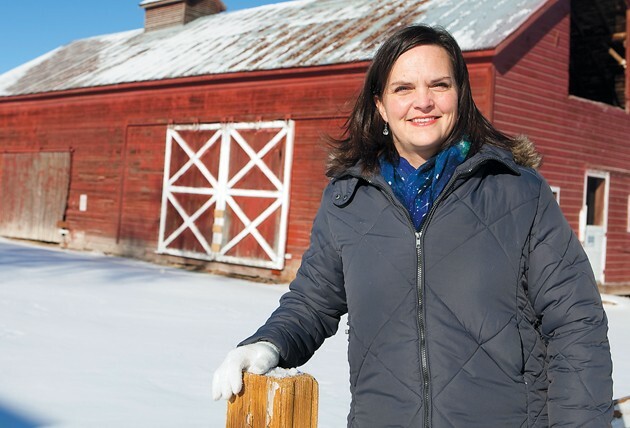 Laurie Hurst stands at the Clark Historic Farm in Grantsville. Hurst worked to keep land surrounding the farm from becoming part of the city’s cemetery. Laurie Hurst in her Grantsville home. 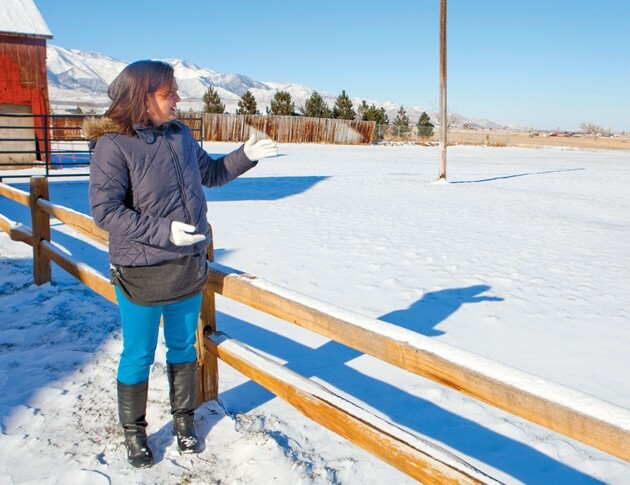 Laurie Hurst, Transcript Bulletin’s 2014 Person of the Year, points out the fields that were slated to become part of the Grantsville Cemetery. Hurst opposed the expansion and started efforts to preserve Grantsville’s Historic Clark Farm. 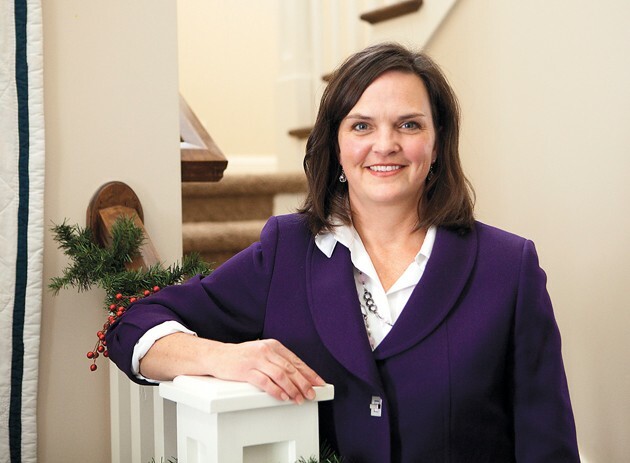 If anyone knows it ain’t over ‘til it’s over, it’s Laurie Hurst, the Tooele Transcript Bulletin’s 2014 Person of the Year. In December 2012, Hurst discovered Grantsville City was planning to expand its cemetery into part of the fields of the Clark Historic Farm, located across the street from the current cemetery on Clark Street. That plan had passed quietly more than two years before in a motion that included a public hearing without so much as a cricket chirp from the empty audience. In early discussions with city officials and reporters, Hurst was told the ship had sailed, the motion had passed and there was little that could be done. All of this Hurst took with a grain of salt. 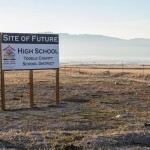 In January 2013, the 41-year-old Grantsville woman stood in front of the Grantsville City Council and asked them to reconsider a plan approved without opposition more than two years before: to designate a portion of the J. Reuben Clark Farm purchased by the previous administration to be the city’s future cemetery expansion. 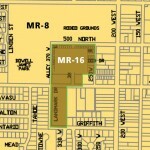 The designated field, located just north of the site’s collection of buildings, had been given roughly $30,000 in sprinkling systems and other improvements for the first plots to potentially be sold as early as that October. The historical property, she argued, was worth more than the revenue from the burial plots. That may be, city officials fired back, but this was up for discussion two years ago and not a single person said a thing in any public hearing, so people must not care that much. Hurst enlisted the help of some friends and gathered signatures from hundreds of residents to disprove that argument — a task, she said, that turned out to be much easier than she had thought. And, with petition in hand and allies in the audience, she made a deal with city officials: If they would allow her to use the property, she would organize events to see if there really was interest or apathy in the community. “What we’re asking for is a chance,” she said. Mayor Brent Marshall and the city council gave their approval, and Hurst got to work. In May 2013, she and the newly formed Friends of the Clark Farm held a 5k race, flapjack breakfast and Dutch oven cook-off. That August, the group sponsored a concert honoring Grantsville’s place on the Old Lincoln Highway, and later that month began hosting a farmer’s market on the lawn of J. Reuben Clark’s home. The activities continued with a harvest festival and live nativity, drawing thousands of visitors. To date, almost 15,000 people have attended events at the farm. As the activities and attendance increased, so did the need for funding. Hurst said when the group first organized, its first funding came from the members themselves. The group has courted historical and governmental organizations for grants to put on activities, pay for permits and event insurance (though the city did cover the farm activities under its policy for the early events) and fund improvements to the facility. Hurst said among the more short-term projects, the group wants to install electricity outside and make the area more accessible for persons with disabilities. To date, the group has received more than $20,000 of grants, with more applications filed with other organizations, and has filed and been granted status as a 501(c)3 charitable organization. Additionally, Hurst said the group is starting a fundraising campaign this year to court donations from not only local history enthusiasts and preservation organizations, but alumni of Brigham Young University’s J. Reuben Clark School of Law and those interested in or associated with Clark’s time as a U.S. ambassador to Mexico. One of the grants, from the Utah Division of Arts and Museums, was used to sponsor the Grantsville Song Cycle. The creative and historical project brought in Philip Bimstein and Hal Cannon, a pair of musicians known for their work on the Grammy-nominated Zions Canyon Song Cycle, and encouraged residents to pen their own tunes about the life and history of Grantsville and the surrounding area. Those songs were performed at a concert last summer at the Clark Historic Farm, and are currently in the process of being recorded for a CD and songbook. They will also be the focal part of this year’s Grantsville Sociable. The 17-man board of the Friends of the Clark Farm includes representatives from other local groups, such as the Daughters of the Utah Pioneers, Sons of the Utah Pioneers and Healthy Homesteaders. Hurst said the group has tried to collaborate with similar groups in an effort to further their mutual interest of promoting and preserving the county’s history. Hurst said ideally she and the group would like the farm to become a hub for local events and celebrations, such as family reunions and wedding receptions, as well as a beacon of heritage within the community. The farm, along with other historic sites like the Benson Gristmill, could ideally be used for asset-based community building — that is, promoting and building around the things that set Tooele County apart instead of homogenizing the area with big box stores and anonymous housing developments. 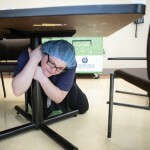 “In doing that, you get a community that’s unique,” she said. In October 2013, Grantsville City purchased a plot of land directly east of the current cemetery for use as an expansion for the cemetery and the city’s maintenance shed. Last month, Marshall petitioned for and was granted a conditional use permit for the area to officially become the city’s next cemetery expansion. The move is more a reprieve than a victory for the Friends of the Clark Farm, as the adjacent lot is expected to serve the city for about a dozen years and the portion of the Clark Historic Farm is still designated for use after that. However, Hurst remains optimistic the group and the city will be able to find common ground on their visions for the property. Although the area designated to be a burial ground does not interfere with use of the property’s buildings, the somber tone of a cemetery would conflict with the cheerful events the group has been holding, Hurst said. However, she said, she believes if the city were determined to create a cemetery at the Clark Historic Farm, doing so in another area of the property’s fields, especially with another inlet that wouldn’t drive a hearse through a heritage festival, would achieve both party’s goals. Hurst said she feels the Friends of the Clark Farm and the city can work together to ease the property’s financial burden to the city and return to the city’s original plan to keep the farm preserved for future generations.